This post is about anxiety.Not the cheeriest of subjects, but one I feel compelled to address, I see a lot of clients who suffer from a range of issues related to anxiety, I myself am no stranger to it,I come from a long line of worriers, maybe it is a learned behaviour for me, never the less it aint pleasant! 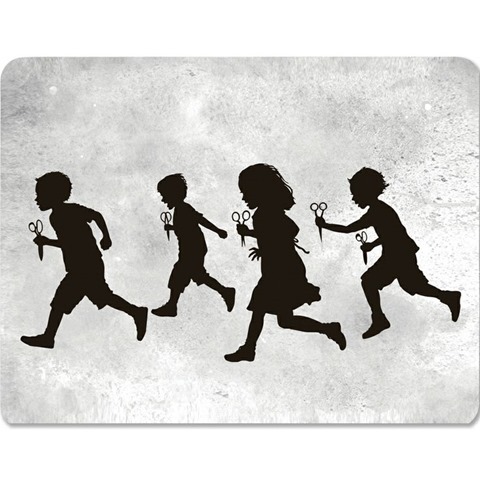 so why the title ‘Running with scissors’? because that’s what it feels like, the threat is always there,one minute you are running along quite happily, but goodness those scissors are sharp! and you are always aware that you could trip and cut yourself at any given moment. An anxiety attack can occur with or without warning. There is a difference in being anxious and suffering from anxiety, there are different degrees of the brute, severe anxiety is extremely disabling, often leading to cases of OCD or agoraphobia. General anxiety is characterized by unrealistic worry about every day events, feelings of apprehension, dread, constant worrying, often about seemingly minor things such as talking to people, or using public transport. What actually happens when you have an attack? well adrenaline is released into the bloodstream, a message of fear sends a signal to the adrenal glands that there is an emergency, it takes less than three minutes for your body to respond to that signal.Fight or flight. Adrenaline causes the heart to pump extra blood around the body, your heart beats faster, your breathing quickens, you may feel shaky or faint. It is horrendous. It is not unheard of to experience chest pain, yes it can be that bad. I am not an expert, you should always consult your GP if you suffer from severe anxiety, if it is reactional anxiety, for example in the weeks before my Dad passed away, I suffered terribly, I physically shook from head to foot the whole time, I couldn’t eat or sleep and had constant palpitations.Obviously this was because of the circumstances, eventually when my Dad passed I had to go and see my GP as I felt I wouldn’t get through the funeral, I was given a short supply of beta blockers, which slow the heart rate down a little, afterwards I did without them and got on with what comes naturally, the grieving process. So really, the point of this post, is to offer a few helpful steps that I give to my Reiki clients, Reiki is brilliant for stress and anxiety, so if you are a sufferer, find a reputable healer and give it a go. But in the meantime these are the four steps I usually recommend, if you do happen to have an attack. 1.Breathe. I know sounds obvious doesn’t it? however, one of the worst feelings is right when the adrenaline is building and you feel like you cant breathe, or breathing comes fast and shallow causing dizziness.So…take a huge breath in through the nose to the count of seven, then let it out through the mouth to the count of eleven, repeat this four times,we call it the 4-7-11 technique, it is a yogic practice to calm and regulate the breath. It takes around three minutes to slow the panic right down. 2. Focus. Distract your brain by engaging your senses. Find three things you can see with your eyes right now. Then find three things you can touch right now, three things you can smell right now, then three things you can hear right now. You see what is happening here? you are being mindful and staying in the moment, thus not thinking or over thinking. 3. Affirm. Gently to yourself, slowly repeat a positive affirmation, such as “All is well in my world, I am safe” or “I let go of all stress, I feel good” or my personal favourite is one that my Yoga teacher taught me “every little cell in my body is well” or make your own affirmation, whatever you feel works for you. 4.Accept. Finally, accept that we are all each doing the very best we can in any one given moment. Anxiety does not define you as a person. As I said earlier, I am not an expert, these techniques are simply ones that have worked for me and my clients, I hope some of you at least find them helpful. Next Article I’m just a girl who can’t say no.